The Atago 2321 MASTER-2α (alpha) is a hand-held, portable, water-resistant refractometer with a Brix scale that measures in the 28.0 to 62.0% range, has automatic temperature compensation (ATC), and is housed in an Ingress-Protection (IP)-65 rated metal body. A Brix refractometer measures the refractive index of a solution in a sample, converts it to sugar concentration in units of percent by weight (% Brix, also known as degrees Brix), and displays the results. Hand-held refractometers, also known as sugar meters, concentration meters, or Brix meters, are commonly used in the culinary, food and beverage, pharmaceutical, educational, geological, chemical, and ecological industries, and for water-testing applications. 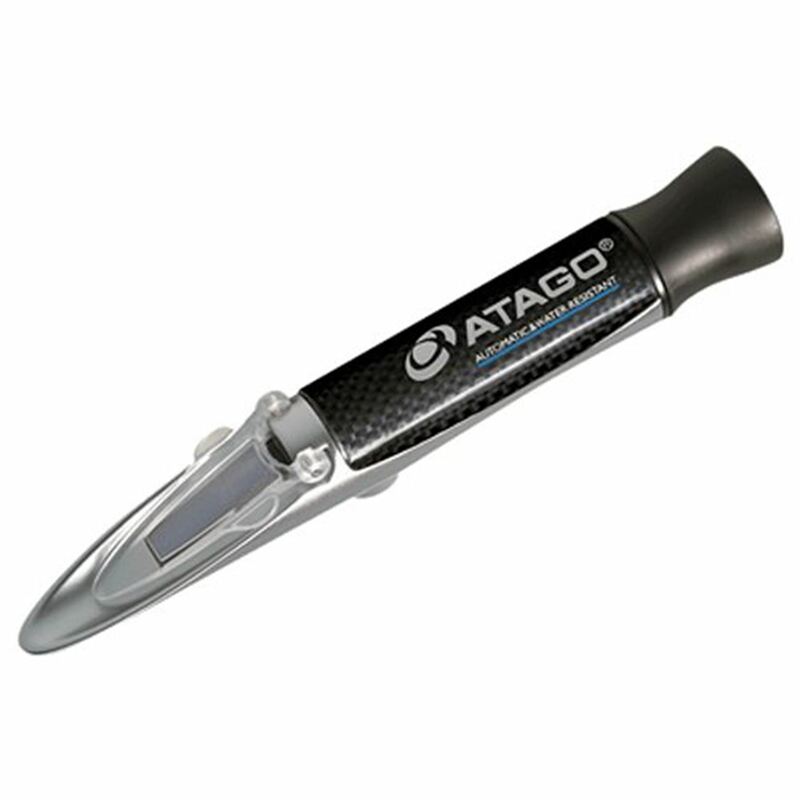 This refractometer is housed in a durable, die-cast aluminum metal body for heat and organic solvent resistance. Its body is IP-65 rated (excluding the eyepiece) for protection against dust and water jets, and the unit can be cleaned with running water under a faucet. The 2321 MASTER-2α features ATC for immediate, accurate readings, regardless of ambient temperature. The unit can be calibrated with water. Calibration can be controlled and adjusted with an exposed calibration screw and an included specialized screwdriver, although other items can be used to unscrew the unit. However, the unit retains its water-resistance. A spoon-shaped tip allows for automatic sample distribution (ASD) across the prism and boundary line (also called measurement line) for accurate, smooth sampling with small portions. The outer shell grip is smooth and easy to clean, which reduces the possibility of food and sample entrapment, avoiding contamination and bacterial growth. The analog Brix scale features a bright, high-contrast display for clear visibility of the boundary and memory lines intersection. Samples are viewed through a monocular, focusable, cushioned eyepiece. The unit includes a protective plastic storage case with a foam cut-out insert to cushion the instrument. Διαθλασίμετρο οπτικό, 45-82% Brix για πετιμέζι, σιρόπια κ.α.